Also referred to as “older age reading blur”, is the eyes loss of ability to focus clearly on near objects. It is associated with aging and will begin to affect most people by around age 45. Early signs are the need to hold reading material further away in order to focus clearly. By age 50 many people can no longer read a newspaper or thread a needle without glasses or lenses. Left untreated it can lead to headaches and fatigue, as well as the frustration of not seeing clearly. As can be seen in the image below, presbyopia is characterized by an inability of the lens to focus the light directly on the retina. 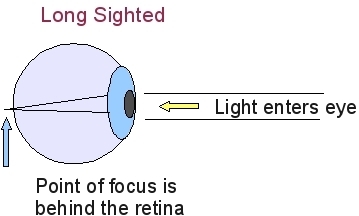 Instead the point where the focused light intersects is behind the retina creating a “long sighted” eye. (This is the same effect as hyperopia or far/long sightedness). In order to focus on close objects the lens of our eye must thicken up becoming more convex. To focus on distant object the lens gets thinner or less convex. This is all controlled by the ciliary muscle. As we focus on distant objects the ciliary muscles relax which allows the suspensory ligaments to tighten, flattening out the lens. When we focus in close the ciliary muscles tighten, and the suspensory ligaments relax permitting the lens to thicken. The conventional theory about what causes presbyopia is that as we grow older the lens becomes more crystalline and less flexible, and the muscles and suspensory ligaments less elastic and responsive. The result is that when the ciliary muscle contracts to accommodate the closer focus point, the lens is less responsive. It may also be that the muscle fails to apply as much force. This combination leaves a blurry image. There is also a relationship of this inability to accommodate the focal point and the convergence of the eyes. Convergence describes the way in which our eyes pull inwards as we focus on closer objects. The closer we focus, the more our eyes converge or look inwards. For example, when holding a book at arms length, your eyes are pointing inwards on a slight angle to converge their line of sight at the book or words on the book. If you move that book in closer, the angle each eye is pulled inwards becomes greater. Here is the point about convergence: Throughout our lives up to our 40’s our accommodation and convergence have been synchronized. They are well established, habitual brain patterns. We “tell” our eyes to focus on X point, and our brain fires off the instructions, as it has done many thousands of times over. But there is one major difference! The lens does not fully respond because it is less flexible. However, the convergence probably does respond. This effectively “decouples” the actual focus from the real convergence point. However our brain “thinks” the task has been completed. The traditional treatment is reading glasses or lenses. However eye exercises and vision therapy can be highly suitable and effective in dealing with presbyopia. Muscle tone and flexibility of almost any part of the human body shows improvement when appropriately exercised. The eye is no different. For many decades eye specialists have believed that the brain patterns and responses of an adult could not be altered, especially as related to vision and the eyes. This is no longer the belief and there is now ample evidence that the adult brain vision pathways and responses are just as trainable as a child’s. The difference is that it requires deliberate effort, whereas for a child it just comes naturally. It is important that eye exercises offer ways to improve the synchronization of convergence and focus. This will ensure that you get the best out of exercises. My personal experience is that you can improve presbyopia and avoid glasses. It does take some effort from time to time, but I never have the problem of losing my glasses or having to get stronger ones!